Today’s theme is anagrams, with the letters of GLEAN appearing at the end of four phrases, in different order each time. 17a. [Lucifer, notably], FALLEN ANGEL. 27a. [It’s not right], OBLIQUE ANGLE. I know my acute and obtuse angles, but not this term. Dictionary tells me that both acute and obtuse angles fall under the category of oblique angles, which are all the other angles that aren’t 90°. 48a. [Oscar-winning actress for “Blue Sky”], JESSICA LANGE. Not many of us saw Blue Sky. Have you been watching Lange on American Horror Story? I watched seasons/series 3 and 4. 63a. [Greta Garbo’s “The Mysterious Lady” co-star], CONRAD NAGEL. Whoa. He’s not the sort of household name these days who you expect to find as a theme answer in a crossword. His OOX and ANYA crossings might slow down the piecing together of his name. I wonder if GLEAN was originally a theme revealer at 55d, where GLEAM sits. 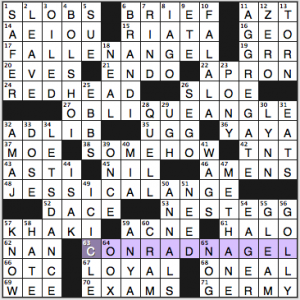 I suspect some Tuesday solvers won’t have picked up on the anagrams and could have used an extra hint (though I appreciate the lack of a revealer). Crosswordese! We have RIATA, SLOE ([Popular gin flavoring], ha! I bet ≥99% of all gin sold is not sloe gin), DACE, and SEGO. Maybe ASTI, ENDO, A MAJ, OOX, ETE. Also, can we put NOG in that category? Nobody calls it NOG, right? It’s eggnog. 36a. [1961 #1 R&B hit for Lee Dorsey], YAYA. Say what?? 71a. [Like bathroom doorknobs], GERMY. Grooooooss. 28d. [Bring under control], QUELL / 29d. [“Disgusting!”], UGH. It’s hard to QUELL my UGH in response to that GERMY clue. P.S. I am quite skilled at avoiding touching public bathroom door handles. 34d. [Hit David Bowie single and album of 1983], LET’S DANCE. Here’s David Bowie performing “Modern Love,” a hit off that album. 47d. [Coal miner’s concern], METHANE. It would be more cheerful to think about cows farting out their greenhouse gases than to think of coal miners in danger of dying from methane. 31A [“___ Ho” (“Slumdog Millionaire” showstopper)] JAI – A different clue that doesn’t reference jai alai. Never saw the movie, but saw it performed on the Oscar show in 2008 when it won for Best Original Song. 33A [Obstruction in the night] SLEEP APNEA – Only clue I didn’t care for. Good misdirection, but I don’t think all sleep apnea is blockage related. Good entry though, so I won’t nitpick! 38A [More reptilian, in a way] SCALIER – Very nice. Something different! 40A [Besting] OUTSHINING – I like this entry too. 63A [“Curious George” author H. A. ___] REY – I have known Curious George since I was a wee lad, and I did not know this. And when I filled in the entry, I STILL didn’t know it. Must be old age…. 6D [Out to lunch] IN LA-LA LAND – Another GREAT entry. 26D [They’re closed, don’t you see?] 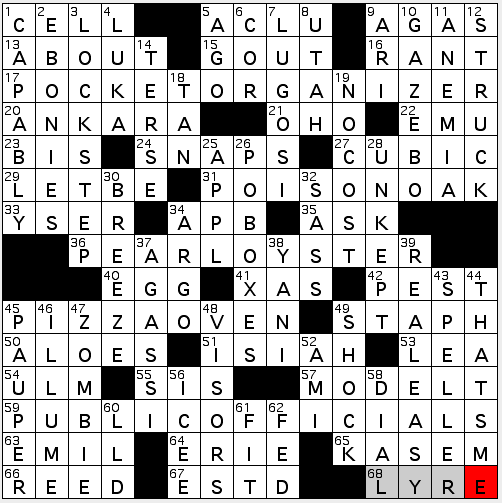 EYELIDS – Greatest clue in the puzzle. Kudos for this one! 34D [“___ + Cat” (PBS Kids show)] PEG – Speaking of entries I’ve never heard of…..
45D [Tater Tots brand] ORE IDA – Is it a coincidence that I’m eating a tater tot casserole this very evening…? 57D [Basketball Hall of Fame coach Hank] – IBA – Long time coach of Oklahoma State. Arena named after him, and I learned he coached three Olympic teams, too. Nice, clean puzzle. 3.5 stars. This was a puzzle that I came to respect far more after-the-fact than in the course of solving. The theme is “perfectly fine”—and one that new solvers are far more likely to appreciate than more seasoned ones, consisting as it does of five “P-O” phrases. The first word of each phrase begins with “P,” the second with “O.” (Yes, there’s more to it than that—and I will get to it). On the whole, though, the phrases are more functional than fun. Then, we’re also met with fill like STAPH and GOUT and ANEMIA—which feels like a lotta signs/reminders of ill health for one little puzzle. ILLUME? The M-W dictionary tells me that this poetic word first came into use in 1602. Google Ngram tells me its usage peaked in 1799… I won’t deny its beauty, but is it the best fill for newbie solvers? Also not sure the puzzle platform endeared me to learning about EMIL Nolde, a most gifted artist who was also a serious and early Nazi sympathizer. Hitler, however, considered Nolde’s modernist talent to be “degenerate art” and had it destroyed; the artist went into hiding until after the war, when his work was once again acclaimed. Can’t find anything that tells me whether or not he ever renounced Naziism. Still, I’m gonna guess that that “Nazi sympathizer” part of the equation has kept him from being loved unconditionally or from becoming a genuine household name. Do I want to learn about Nolde and his art? Absolutely. Do I want him in my puzzle, which I do for entertainment? I’ll pass. Your mileage may definitely vary!! 17A. POCKET ORGANIZER [Hanging storage unit with compartments]. We start with a grid-spanner, so that means we’ll end with one, too. 31A. POISON OAK [It might cause a rash response?]. 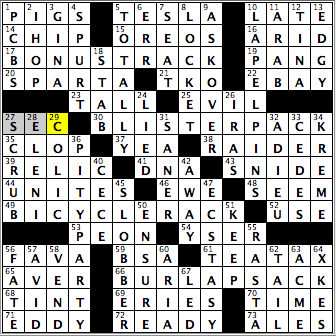 Love the clue, but get itchy at the thought of the stuff (see also: staph, gout, anemia…). 36A. PEARL OYSTER [Bead-producing mollusk]. Flat out loved this one. Conjures up a beautiful mental image. 45A. PIZZA OVEN [Pie-making need]. Well, maybe not a “need,” since even conventional home ovens can do the trick, but I enjoyed the clue, which hinted not at all at pizza, and initially put me in mind of something more like ROLLING PIN or FLAT SURFACE… Nice misdirection with a good payoff. 59A. PUBLIC OFFICIALS [City hall honchos]. 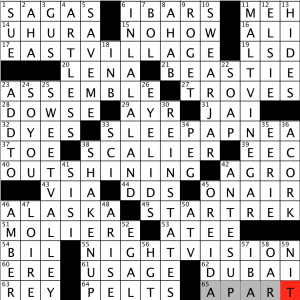 Peppy clue enlivens stolid, grid-spanning fill. So all-in-all, the puzzle is CAPABLY done. While I can’t say that this one STRUCK any rich cruciverbal gold, it did trigger a bunch of recollections, which I always take as a plus. And next week? Crossword Nation’s 4th birthday. Someone bring cake! 26A [Derby drinks] JULEPS – Timely! Kentucky Derby was just a couple of weeks ago, complete with mint julep recipes and gaudy hats! 42A [Before-marriage contracts, briefly] PRENUPS – Nice entry. Again, something different. 30D [Bit of beach footwear] THONG – Not what I think of when I think of a thong. This is clued much … nicer! 33D [Flanders Fields flower] POPPY – Not a reference I’m familiar with. I looked it up. A poem written by a Canadian soldier during WWI. Very nice. Again, always nice to learn something. 37D [Computer user’s accessory] MOUSE PAD – My son says this is really more of a computer user’s accessory accessory. You know, the mouse is an actual accessory…. never mind! Nice entry anyway! 52D [“Return of the Jedi” dancing girl] OOLA – I’ve seen all the Star Wars pics over the years, and I don’t remember EVER seeing this girl in a crossword. I’ve seen OONA Chaplin and OO-LA-LA, but never this. Very nice, though. Good day, everyone! Hope you’re all well. Today’s crossword, brought to us by Ms. Gail Grabowski, includes four theme answers that all start with the letter “B” and end with the letters “ACK.” At one point, was expecting one of the answers to at least start with the letters “BA” and end with “CK,” like BAT RACK (possible clue for that: What might be seen in a dugout). You’re welcome to use that clue in a future crossword construction, if you do that sort of thing. With all of the sporting events that I’ve been going to lately, I’m starting to rack up the number of complimentary LAPEL PINS that I own (10D: [They’re stuck through jacket flaps]). Initially put in ‘tea act’ instead of TEA TAX, and hoping I wasn’t the only one that did that during the course of solving (61A: [Cause of a rebellious 1773 event in Boston Harbor]). This was a puzzle that a foodie, particularly one with a sweet tooth, would love, with the presence of OREOS (15A: [Tiered snacks]), KREME (34D: [Krispy _____]), and FAVA, which will always remind me of Anthony Hopkins’ role of Hannibal Lecter in The Silence of the Lambs (56A: [____ bean]). Who’s got the Chianti? “Sports will make you smarter” moment of the day: PANG (19A: [Sign of hunger]) – This puzzle gave me a real challenge in turning a clue and giving it a sports context, but finally saw one, as I can tell you about former Chicago Blackhawks goaltender Darren PANG. Pang currently is one of the premier hockey analysts on television, but he also played briefly for the Blackhawks, and was second in the Rookie of the Year voting (Calder Trophy) in the 1988 season. Pang was only 5’5″ and was one of the shortest goaltenders to ever play in the NHL. This entry was posted in Daily Puzzles and tagged Allan E. Parrish, Elizabeth C. Gorski, Gail Grabowski, Marti DuGuay-Carpenter, Matt Jones. Bookmark the permalink. NYT: I’d have given it 3 stars as well, except for the cross of UGG and UGH in the center, which cracked me up, so 3.5. Since sloe gin is not a kind of gin that statement doesn’t quite ring true. I’ll stipulate that a lot more gin is sold than sloe gin, but they’re very different. Gin is a spirit and sloe gin is a liqueur made with gin, sloes and sugar. Gin usually is bottled at about 95 proof; sloe gin is about 50. Saying sloe gin is a kind of gin is like saying Drambuie is a kind of scotch. That said, is it fair to call sloes a popular gin flavoring? If we consider the universe of gin flavorings (ingredients added to existing gin as opposed to ingredients used in the manufacture of gin), instead of the universe of gins, it certainly is. I can’t think of another flavored-gin liqueur, although there must be others. Most liqueurs are made by infusing herbs in neutral spirits (vodka). There are many popular vodka flavorings. Not so many gin flavorings. Quality sloe gin has some similarity to Japanese umeshu (“plum wine”), which I make most summers. The sloe (Prunus spinosa) and the ume (Prunus mume) are cousins from different continents. It’s interesting that the English and the Japanese hit upon using them the same way. Umeshu is made with shochu (distilled sake), ume and sugar. In both cases, each fruit is pricked and macerated with the sugar to draw off the juices, and slowly mixed with the local spirit over a period of several months. When I was little we used to eat wild sloes off the bush as a dare. They are wince-inducing. I don’t think I go along with your definition of ‘popular,’ which in this case seems to mean that sloe gin is the only fruit-flavored, gin-based liqueur you can think of. I have a feeling that bottles of sloe gin, if you can find them, are among the products gathering dust in the back room of your local liquor store. Also, NEAL and ONEAL in the same puzzle? And I although I am no kind of neat freak, I don’t think my bathroom door knobs are particularly GERMY. In fact, I recall there have been studies showing that kitchen cutting boards are more like to harbor nasty bacteria than toilet seats. Toilet seats are relatively germ free compared to door handles because hands are more germy than rear ends. Cutting boards are not in the equation. I think the problem here is regarding bacteria as nasty rather than ubiquitous and mostly harmless (and often beneficial). There are bacteria in every breath we breathe; if they were all so nasty, why aren’t we all dead? 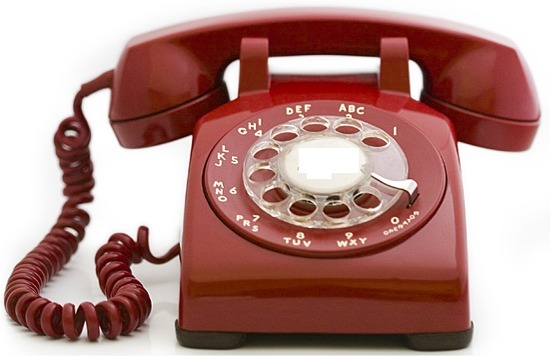 What is that classic American number with the lyric “peaches, plums or sloes”? I can’t place it. Our primary school music teacher made us sing that and most of the rest of the hits of the first half of the 20th century. To the googles! I used to catch the commuter rail from Lynn into Boston–there’s a big GE engine plant there that is only a shadow of what it must’ve been like in its heyday. To make it explicit, the danger is from methane explosions. And now, thanks to Evad, I can segue to “I Asked For Water (She Brought Me Gasoline)“. LAT: Great early week theme. No excuse for the top- and bottom-right corners. NAUT is desperation fill, OTOE is at best a necessary evil, here it’s not. It’s a 4×4 corner with one theme answer anchoring it!? Bottom-right is even less constrained. OOLA is not a word you put in out of choice. There are a million ways to fill that corner and avoid OOLA. Actually the same applies to the top-left and ETES. OTOE and ETES at least are acceptable when they hold together something, here they just seem to be there because they were the first thing that fit. Outstanding LAT puzzle!! I really enjoyed the unusual clues. I love Lee Dorsey (NYT)!